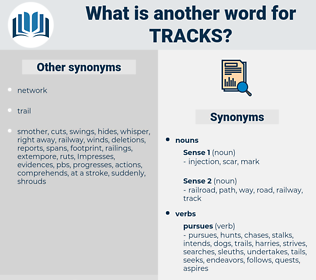 What is another word for Tracks? circuits, sidings, pistes, tracking, trails, Paths. Opportunities, means, LINEs, approaches, Paths. approaches, interface, marks, music, musicales, musical, future, observes, Exploring, suit, follows, Remedies, read, leads, possible, below, flap, trail, trails, trace, traces, Paths. 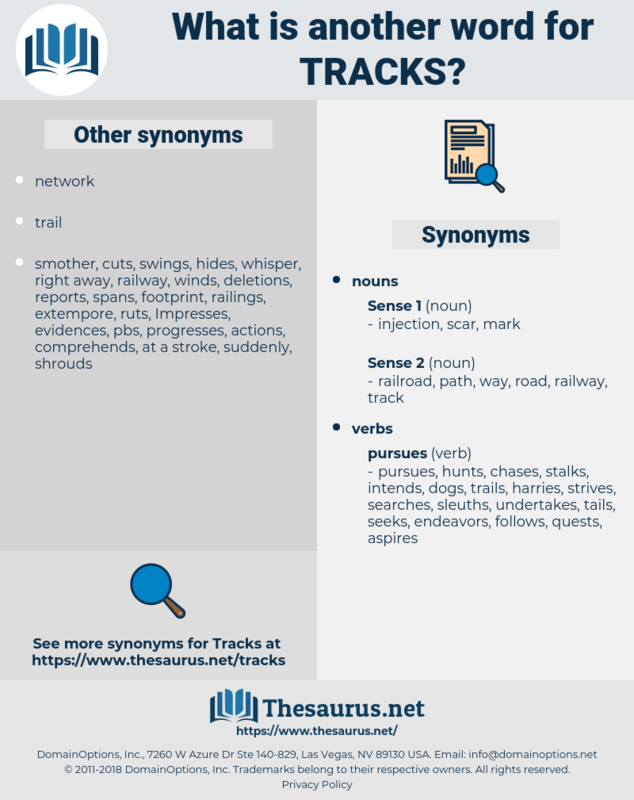 charts, tracing, tracings, trainsets, matters, course, caterpillars, trade-marks, characteristics, trains, Trainings, considerations, Distances, tranches, conversations, Records, Trademarks, indicators, crossroads, perspectives, travellers, cars, locations, subcomponents, proceedings, TREADS, cornerstones, chapters, thoroughfares, careers, approaching, Categories, sub-components, respects, parcours, roads, targets, effects, indications, parts, railroads, quarters, directorates, backgrounds, Standards, procedures, alternatives, crossing, crossings, waters, Undertakings, stretches, trades, platforms, Itineraries, Fingerprints, objectives, terms, walkways, patterns, battlefields, follow-ups, follow-up, routings, Negotiations, Routing, entrances, corridors, markers, Occupations, sectors, rafts, roadmaps, sections, advancement, steps, Directories, marking, markings, aspects, airfields, scrambles, courts, brackets, frontlines, disciplines, steppings, Facilities, displacements, rhinoceros, Referrals, constituents, canals, shutters, passageways, remnants, stars, scraps, bridges, blocks, accesses, dossiers, approach, mechanisms, features, fingertips, talks, Arteries, sub-programmes, decks, processes, baselines, Activities, Histories, threads, extents, casts, barriers, provisions, IMPACTS, blueprints, smithereens, rangelands, initiatives, editions, chemins, Arenas, Patches, grooves, streets, PROSPECTS, releases, Journeys, playbooks, arrears, networks, surroundings, clusters, Guidebooks, headings, priorities, handbooks, gates, ingredients, stripes, tasks, fields, indentations, Industries, versions, scopes, axis, contests, portions, bands, tiers, Hotlines, spheres, affairs, Possibilities, FACETS, fragments, sightings, adaptations, Incentives, Selections, yards, chansons, iyrics, remains, extensions, streaks, segments, portals, issues, contexts, instances, Miles, settings, Branches, cables, Backs, instalments, stages, affiliates, bars, reminders, lengths, tails, pointers, errands, tours, LONGLINES, Horses, drafts, imprints, Securities, Suggestions, groupings, Infections, signals, packages, Guidelines, vouchers, walks, scripts, folders, Boundaries, footprint, footprints, Scars, throes, chains, orbits, advance, advances, samples, agendas, plots, impressions, Clips, beatings, discussions, solutions, things, Opportunities, methods, subjects, Workshops, lyrics, sites, Cues, pillars, Vehicles, arms, Foundations, regards, outlines, volets, shafts, Larvae, fireworks, poles, passages, proposals, Maps, dimensions, Keys, titres, rows, Beaches, runners, pipelines, prints, planks, sliders, LOOPS, items, Communities, Boxes, airways, shores, sources, levels, rings, layers, vestiges, readings, Classes, bits, reaches, Marques, Foreheads, Voices, mountains, Feet, grounds, links, ranges, titles, FARES, horizons, strips, amounts, questions, counts, Axils, Bets, suites, grade, grades, inputs, realms, WINDOWS, manuals, expanses, points, tunes, domains, options, shoes, guides, modes, paints, thrusts, purviews, binaries, spindles, voies, pieces, degrees, Groceries, plaques, venues, axles, exits, Styles, headlines, RIGS, rhinos, sets, Vistas, Forms, kinds, Phases, flaps, cubes, Stains, Focuses, files, spans, clues, Angles, fronts, divisions, Las, drains, SLOPES, legs, powers, fingers, plans, Axes, levers, hints, niches, series, brands, tips, chunks, planes, Toys, Chips, insights, Shots, Ones, kiosks, doors, VOTES, means, dots, tenets, impulses, Forums, games, dogs, assaults, ends, wings, sub-claims, nets, sides, Ideas, Ponies, drawings, Dies, outlets, shops, riels, slabs, Bruises, cuts, lignes, Blinds, wagons, Prisons, waves, prongs, Goals, heels, slices, panels, rods, slots, hubs, NODES, flows, types, groups, Asses, modules, Shelves, choices, brows, media, vents, signs, designs, hoses, pipes, fold, LUMPS, solids, rounds, Bases, line, LINEs, runs, approaches, marks, follows, Remedies, leads, monitoring, monitors, trace, traces. ascertains, replicates, locates, checks, incorporates, retraces, measurement, scrutinizes, captures, reports, charts, calculates, accommodates, evaluates, indicates, enumerates, detects, investigates, gathers, parallels, measure, actuates, acknowledges, collects, summarizes, regulates, registers, repeats, watch, Watches, updates, summarises, reiterates, allocates, determines, accrues, covers, undertakes, maintains, conserves, adheres, describes, achieves, dedicates, understands, demonstrates, supervises, encompass, encompasses, verified, verifies, implements, control, controls, presents, receives, reassesses, relates, accounts, appraises, estimates, conforms, portrays, Addresses, inspects, adjusts, comprises, reproduces, apprises, reflects, illustrates, validates, notes, highlights, operates, suggests, recounts, considers, Records, audits, compiles, retains, governs, chronicles, reviews, cites, assesses, continues, attests, stores, oversees, writes, includes, alleges, stalks, recognizes, reveals, incurs, preserves, switches, assures, edits, strives, examines, suffers, delivers, secures, realizes, embraces, denotes, lists, mentions, conducts, ensures, introduces, pursues, manages, performs, insures, complies, smears, matches, responds, takes, adopts, specifies, discloses, depicts, speaks, echoes, conveys, satisfies, helps, spots, submits, extends, involves, enables, belongs, keeps, reads, Drives, handles, pays, attends, finds, defines, mirrors, undergoes, allows, tells, refers, applies, draws, PAVES, enjoys, Permits, enters, hunt, hunts, remembers, seizes, discusses, provides, lays, wraps, resumes, shutters, fits, embodies, Rests, holds, looks, serves, logs, passes, wishes, puts, weighs, sees, scopes, runways, seals, remains, builds, goes, senses, bars, footprints, outlines, volets, Maps, shows, prints, counts, tunes, sets, spans, means, cuts, runs, approaches, observes, follows, leads, trails, trace, traces, Paths. Trajectories, tracts, Orientations, airstrips, road, Races, carriages, Footpaths, roadways, songs, conduits, LANES, runways, highways, sheets, footsteps. They were still following Sixth Avenue beneath the elevated tracks. I observed that the tracks were quite fresh.